Dimitris Mytaras (1934-2017) and Alekos Fassianos (b.1935): two outstanding pillars of contemporary anthropocentric painting through the content and the portrayal of basic, new parameters which reshape and continue to characterize styles and versions of our newer and contemporary artistic creation. 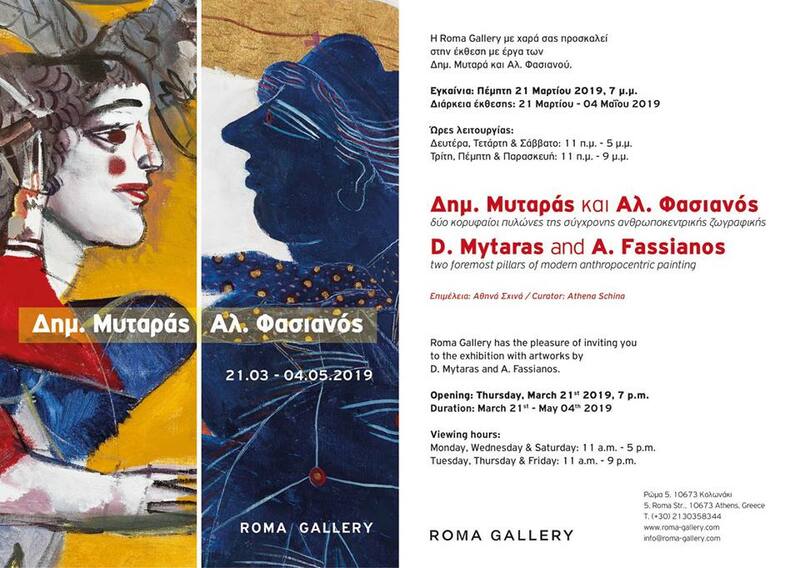 Roma Gallery opens on Thursday, March 21, at 7:00 pm with an exhibition of anthropocentric artworks by these particularly significant creators. The creators are Dimitris Mytaras,(1934-2017) and Alekos Fassianos (1935), who represent among other things, two exceptional pillars of our anthropocentric painting genre. The works of these two artists of course differ between them, in their expressive style, their execution and in their inspiration as from past experiences indicated by the curator of the exhibition Athena Schina. She emphasizes that concomitantly the works of these distinguished creators in the gallery space, offer the viewers a chance to participate in an informal dialogue with a foundation in “theatricality” which they both execute and negotiate between them each in their own different way. The figures of Dimitris Mytaras work simultaneously as faces and as masks. Through their “dramaturgical” similarities and dissimilarities they imprint visions of both the ephemeral and the long-lasting, of desire and nostalgia, of the daily mundane and the dream. Dynamic within the space yet still light and ephemeral, elegiastically imposing, these multifaceted figures by the artists come to the front stage transformed into idols and allegorical figures. Attractive and enigmatic, they appear as if through a visual curtain, they balance paradoxically in between reality and utopia, evoking in the viewer each time new provocations. These aesthetic and meaningful provocations through light and reflections dictate similar existential questions which relate to individualism and totality, the truth and the illusion, the simple and the excess, from the present to what is beyond. Alekos Fassianos creates bridges with giant steps forward through his suggestively dynamic forms with the vitality of a “fairytale”. The story weaves a poetic web and with the expression of a glorified elegy transforms visions of cultural situations that have been registered in our deepest subconscious. His shapes, through an unpretentious and non conforming child-like vision which knows how to create “body-forms” through theatricality and myth, the meeting between East and West. This encounter occurs upon what one would think of as a stage. These explosive and intense figures which appear both in motion and stationary, both ordinary and timeless, full of light from within and full of color, dominate and pulsate in their time and place and simultaneously dismiss their grandeur. Parallely, they work as interconnected rings which unite through continual and non continual emotions likely taken on the one hand from the ancient and Byzantine periods, and on the other hand from memories and realities from our Folk art, but also from our contemporary, cultural humanistic and European culture.